Nonlinear Optical Crystals(NLO) are important elements in Fiber Lasers to convert laser to double frequency of the laser radiation. However, application of these crystals (LBO, BBO and etc…) with high power lasers is able to damage these crystals and lead to catastrophic degradation of the whole laser system. Characterization NLO crystals and estimation defect density on the crystal surface (and 1 μm-100 μm inside the crystal ) potentially let fiber laser manufactures obtain the best quality NLO crystals with minimum defect density and avoid catastrophic degradation the laser products. Here, we present methods best fitted for LBO -NLO crystals characterization and defect density measurement. The most sensitive method for characterizing laser induced damages in LBO is reflectance measurements with Confocal optical contrast and Scanning Probe Microscopy( AFM). 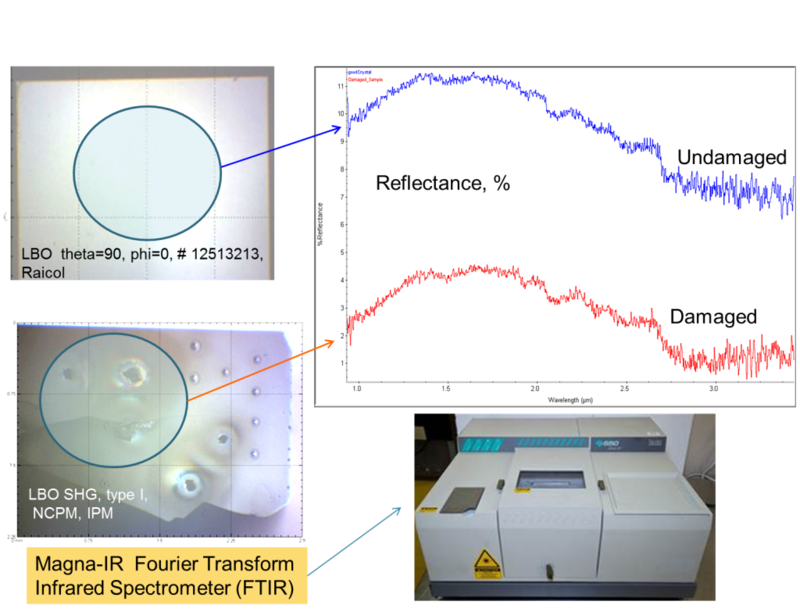 Overview of characterization LBO crystal exposed to high power UV laser pulses using simultaneously Atomic Force Microscopy(AFM) imaging and Optical Spectroscopy by applying ACTO-S product(http://actoprobe.com/products/actoprobe-s/actoprobe-l). In the top left corner is shown conventional optical image of LBO facet with many craters -result of optical breakdown in this material. AFM image of the crystal surface near one of the craters is presented in upper right corner. A lot of debris and micro holes are observed near the crater. In the lower right corner AFM image of undamaged area is shown. There is much less debris in this part of the crystal and they much smaller in size. These AFM images suggest that the debris are most probably originated from the craters as result of optical breakdown. In this figure we also present optical reflectivity spectra for damaged area and unexposed region of the crystal. Reflectance is 15 times smaller in damaged area than in undamaged one. 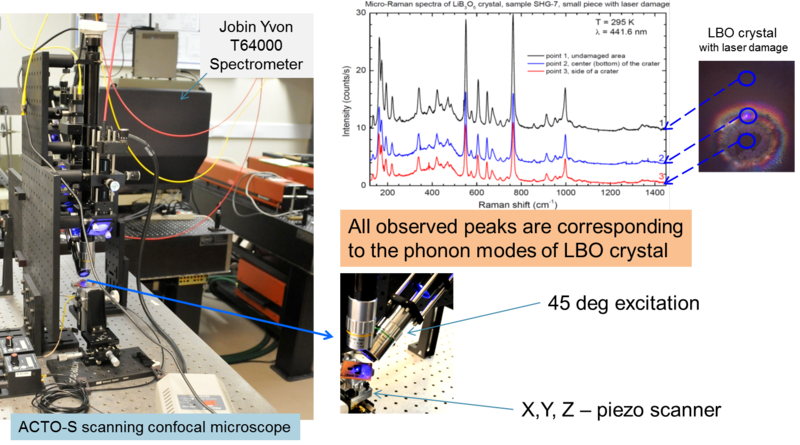 Raman spectra of LBO crystals measured with the ACTO-S microscope combined with a Jobin Yvon T64000 triple spectrometer equipped with a liquid nitrogen cooled multichannel CCD. A 441.6 and 325 nm lines of a He-Cd laser were used for excitation. 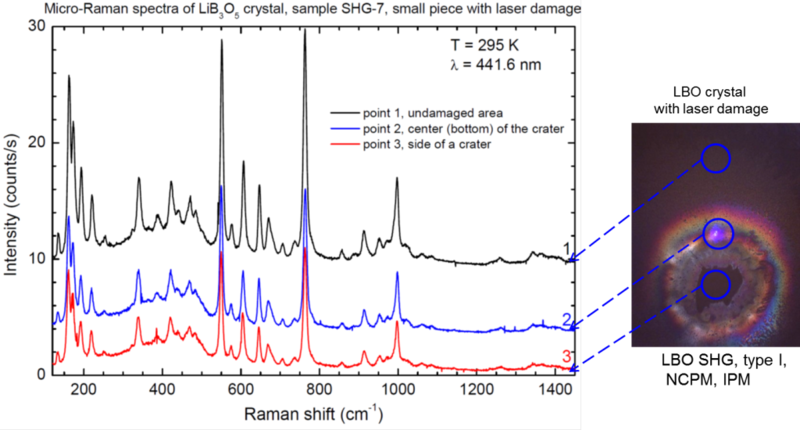 The magnitude of the Raman signal is decreased in the damaged area and relative magnitude of the peaks is changing compare to undamaged area suggesting the material composition change in the damaged area. 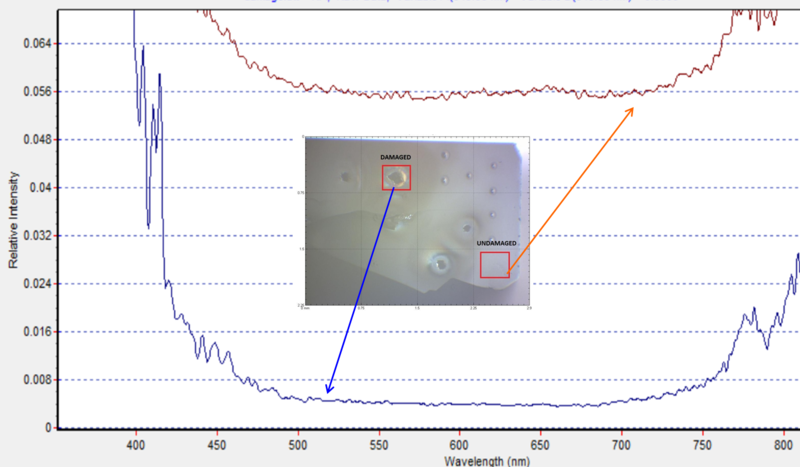 The small difference in Raman spectra between damaged and undamaged area is result of high transparency of the crystal. Most of the Raman signal is collected in the bulk of the crystal and relative contribution from the damaged surface is small. Damages in LBO crystal are very strongly correlated with reduction of reflectance in the corresponding regions of the crystal: reflectance drops more than in order magnitude. It suggesting large change in index of refraction in damaged area. 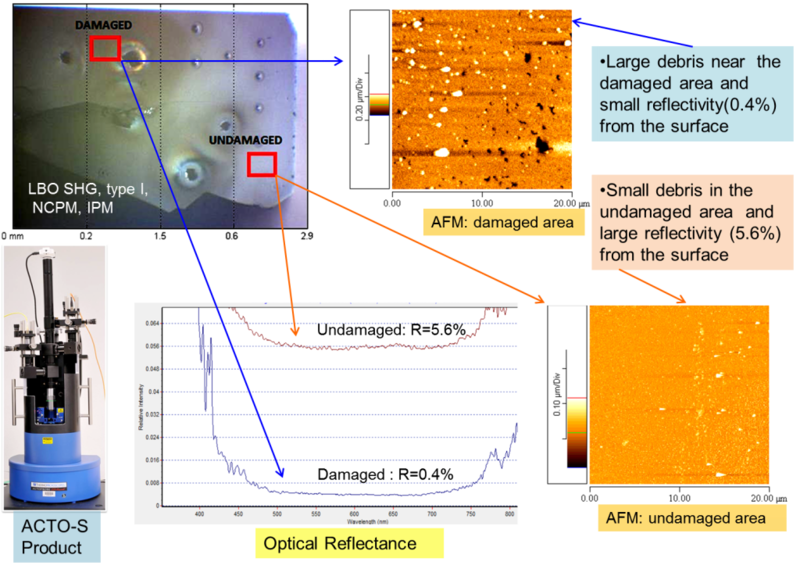 Large – a few micron in size debris are observed near the damaged area and practically no debris in undamaged areas are seen using AFM microscopy. 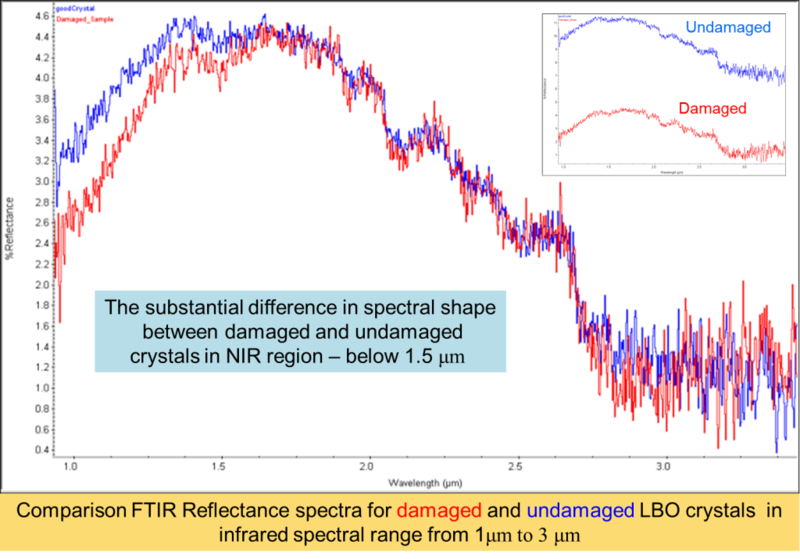 Substantial difference in spectral shape is found between damaged and undamaged crystals in NIR spectral region near 1μm applying FTIR. 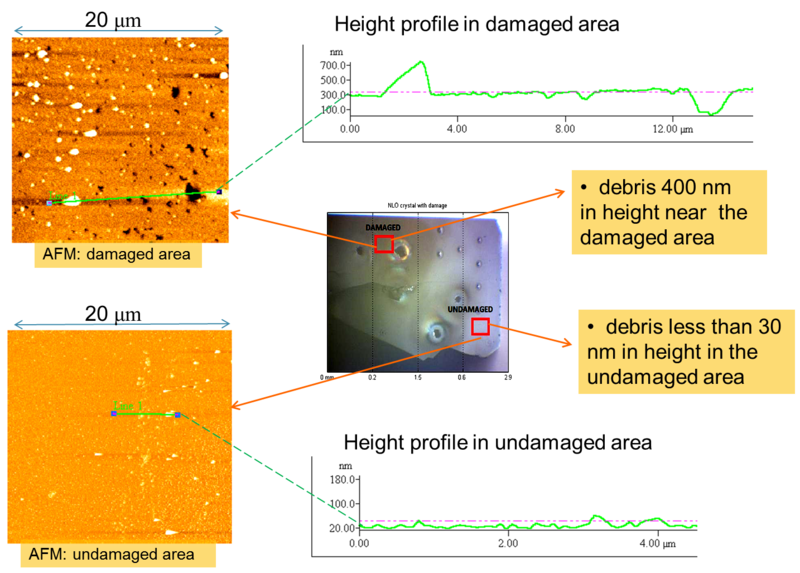 The magnitude of the Raman signal is decreased in the damaged area and relative magnitude of the peaks is changing compare to undamaged area suggesting the material composition change in the damaged area. Measure reflectance map at wavelength where is the biggest difference between damaged and undamaged samples. Tip Enhanced Raman (TER) technique to measure Raman spectra in damaged area on the crystal surface. Measure reflectance spectra for damaged and undamaged crystals in UV range. Measure reflectance map at wavelength where is the biggest difference between damaged and undamaged samples ex. NIR, λ=1μm. Apply Tip Enhanced Raman (TER) technique to measure Raman spectra in damaged area on the crystal surface and get rid of the Raman signal from the bulk.